Otjiterazu offers you the opportunity to ride through the bush on a Quad Bike, an exciting experience, as you get close to the game. 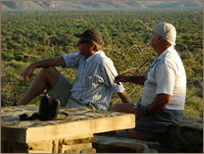 We offer Game drives as well as sundowner game drives or you may want to hike along our mountain trail and enjoy the beauty of nature, offering you the opportunity of spotting different game species. Bird lovers will enjoy the vast variaty of species spotted on the farm. 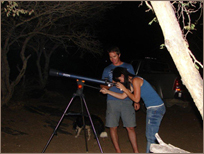 We can offer you an nocturnal game drive where you might even spot a Leopard, Porcupine, Bat-eard Fox, Cheetah, Caracal, Serval Cat, Hyena or Aardwolf. As we are currently in a breeding process with the Golden and White Oryx you might spot this exotic animal and even a new born. In the Game Camp we have roaming Waterbuck, Eland, Zebras, Rooibok, Springbok, Blue Wildebeest, Black Wildebeest, Giraffe, Ostrich, Kudu, Oryx, Hartebeest. Otherwise, just relax at the pool in the beautiful garden. For the sports enthusiast a game of golf or jukskei can be played on our farm course. You also have the opportunity to see different parrots,birds and other animals. Hobby photographers and nature lovers, will find it interesting to sit in a hide and study the game species, Francolin and Guinea fowl at the water holes or listen to the call of the jackal while watching the colorful African sunsets. What about a shopping trip to Windhoek? We will gladly take you to the capital of our beautiful country. There are numerous museums, landmarks and historical places to visit. Curios and other memorabilia are available at a large selection of stores and shops. As we are the owners of Kaisosi River Lodge on the banks of the Okavango River we can arrange a trip to the lodge, known for its beautiful Namibia sunsets and Tiger fishing as well as the occasional visit from a Hippo or two. It’s a true African Oasis.